The herd provides company and safety. Belonging to a herd assures each member that they will follow a matriarch to food and water. There is also ample opportunity to rest easy and catch a nap because other members of the herd will look after the sleepy. Although many horses are compliant with working and riding, leaving the herd is an unnatural request that we have of them. A “herd bound” or “barn sour” horse is communicating in whatever ways he can, to tell his rider he does not feel safe leaving the herd. It then becomes our responsibility to change this uneasy feeling for him by first recognising the behaviour for what it is. The protection and safety he receives from the herd diminishes when he leaves. This security could be lacking in his relationship with his rider, which becomes more obvious the further away from the herd he goes. These unwanted behaviours can be cleared up by establishing a higher level of trust in his rider and confidence in himself. What does a herd bound horse look like? Some horses begin showing signs of stress as soon as they are lead out of the paddock. Tense eyes, calling, rushing, pulling and pushing into their handler are various signs that the horse has become uncomfortable. More severe actions such as sweating, pawing, pacing, and trembling are a clear sign that the horse is in obvious distress. Even minor stress will negatively impact their focus and frame of mind for learning. It is important to address their concern before they unintentionally hurt themselves or their handler. Implement these strategies to help your horse understand that you make good decisions for him and can keep him safe. Horses who stress when they are left in the paddock while a herd mate is taken away will benefit from these strategies as well. Leave a fresh pile or net of hay along the fence line where they tend to spend most of their time. Spread some treats around in the hay. Some horses find this foraging exercise distracting enough to settle themselves down. 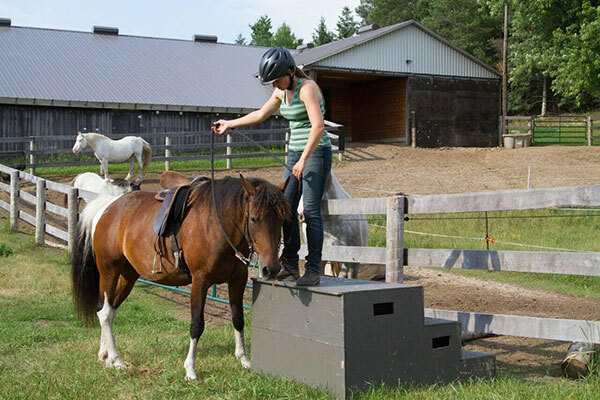 Begin your session with your horse close to the paddock. Then slowly move further distances away once the left behind horse relaxes enough to eat. Return to the paddock regularly, so the left behind horse can see that their friend is not gone for too long. This exercise can be practised under saddle or in hand. Spend time doing something he enjoys when you take him away from the herd. Massage, grooming, simple tricks, and hand grazing are some options to change his opinion of leaving from negative to positive. Determine how far away he can go from the herd before showing signs of mild discomfort. Draw an imaginary line where that is. Spend your sessions approaching and retreating from that line. (It may be 10 feet away from the paddock, so be prepared to work in a small area at first) Eventually he will remain relaxed at further distances, even when home ends up out of sight. Prove to your horse that he is in capable hands. Horses can sense when we feel calm and confident. Work on exercises that you feel comfortable practising with your horse. Keep the line of communication open. Check in with your horse regularly with a simple request – if he is unresponsive then he is probably distracted. Distraction can lead to tension and stress. Regardless of the nature of their herd bound feelings, consistency will go a long way. Repeating these exercises several times weekly will establish a more positive feeling that leaving the herd is “routine.” He will begin to expect that leaving the herd is connected with lots of scratches and a consistent session with a consistent rider. It is simple – horses are herd animals. Sometimes a horse will seem quiet and less interested in other horses when they are forced to live without companionship. This is not healthy, and their quietness should be seen for the depression that it is. Teach your horse that he can feel safe when he leaves his friends. His mental health relies on a social life for all the hours in the day.